Nicki Minaj’s Use of Famous Malcolm X Image Causes Uproar; What’s New? About 2,000 people signed a petition, urging Nicki Minaj not to use this image of Malcolm X that was shot by Don Hogan Charles. “What seems to be the issue now? Do you have a problem with me referring to the people Malcolm X was ready to pull his gun out on as lookin a** ni**as?” Minaj asked Thursday on Instagram, in the caption for a screenshot from the single’s video. The controversial cover is not the official artwork for the single. Many did take issue, so much so that there’s now a petition to change the cover photo of the single. “Without the work and life of Malcolm X, you would not be able to do what you do,” wrote Rosa Clemente, the hip-hop activist and 2008 Green Party vice presidential candidate who started the petition. “Unfortunately you have chosen to disrespect and dishonor the legacy that he left us.” Clemente’s petition reached more than 2,000 signatures on Friday. Ilyasah Shabazz, one of Malcolm X’s daughters, denounced the cover in a statement to the New York Daily News on Friday. “Ms. Minaj’s artwork for her single does not depict the truth of Malcolm X’s legacy, is completely disrespectful and in no way is endorsed by my family,” Shabazz said. 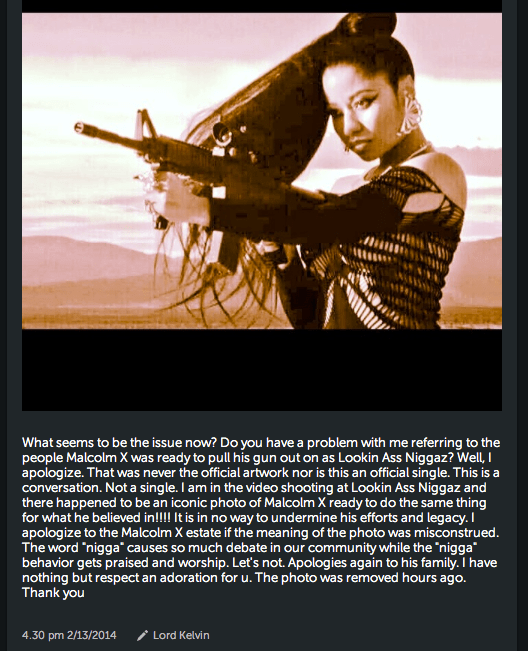 Minaj apologized to Malcolm X’s family and removed the image from her website, MyPinkFriday.com. The cover uses Don Hogan Charles’ iconic 1964 shot of Malcolm posing by his window, M1 carbine assault rifle in hand. Malcolm, according to legend, had the photo taken to show his readiness in the face of death threats and a near-fatal firebombing of his house. Malcolm’s image has been so appropriated that this is but a scribble on a long list of offenses. 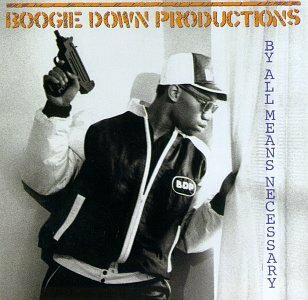 The man became merchandise long before Smiley sold his pictures on the street in Spike Lee’s “Do the Right Thing.” Boogie Down Productions used Malcolm’s pose for the cover of their 1988 album “By All Means Necessary” (with KRS-One holding an Uzi instead of a rifle to give the picture some ’88 flavor). “Lookin A** Ni**a” is not earthshattering. Minaj raps aggressively toward those who would question her position as one of hip-hop’s few successful female MCs. Corny punch lines, typical Nicki Minaj flows shifts all over the place and a beat that sounds as if producer Detail handed Nicki his file of “Nothing Was the Same” leftovers. What exactly did Nicki Minaj see in the photo that caused her to use it as the cover for her single? Malcolm’s rifle is on display, as he peeks out the window, to scare those onlookers who might wish him harm. 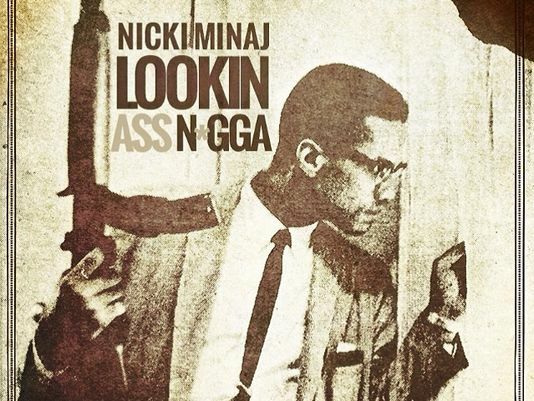 In the video, Minaj fires off at “lookin a** ni**as,” much as, she claims, Malcolm X was ready to do out of his window in ’64. Nicki Minaj is no BDP, but her use of Malcolm’s image is in the same vein. She is an artist who used an icon to carry her message. That message is: Those who would cause me harm will be dealt with. Whether Malcolm would have agreed with her is something that only he could have discerned. What you can do, this Black History Month especially, is take some time out and familiarize yourself with the work of Malcolm X. Read his autobiography, his speeches and his interviews. Daniel White, who covers politics and culture for 101 Magazine, is the opinions editor for The Hilltop at Howard University.